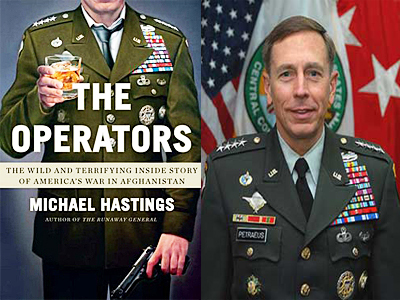 Hastings book, The Operators: The Wild and Terrifying Inside Story of America's War in Afghanistan, an expanded work on the original story comes out tomorrow, but the jacket illustration is raising some eyebrows. It appears to show a man wearing the uniform of former Iraq General Petraus, who had been in the Army since 1974 until retiring in September to head the CIA, balancing a glass of amber liquor in one hand and a service pistol in the other. In those 37-years, the medals and ribbons he accumulated on his uniform may not have been as unique as his fingerprint, but they're close. It may be added that McCrystal criticized Harmid Karzai, Vice Pres. Biden and President Obama, which prompted the president to recall McCrystal from Afghanistan and fire him on the spot.